Keary Saffold can still remember the way his second-grade teacher made him feel when he wrote “God” instead of “good” on a spelling test and she curtly pointed out his mistake. “It made me feel two inches tall,” he said, adding it’s the sort of interaction that can trigger or fuel an inferiority complex in youth. Reflecting on his elementary years in the Minneapolis Public Schools district, Saffold admits he could be “rambunctious” at times, feeling pressure to assert his masculinity while among his peers. But the reason he still thinks back to that particular moment in second grade is because it exemplifies the strained relationship he had with his teacher — the very teacher who approached his parents, suggesting they get him evaluated for an emotional or behavioral disorder. “As I look back on it, she didn’t know who I was. I was a poseur and she bit the bait,” he said. Thankfully, he says, his parents — both educators — knew who he really was, and they stood their ground. Rather than allowing anyone to mislabel their boy, they exercised their right to open enroll him in other districts that better fit his needs. He attended public school in Mendota Heights, then a Catholic school in St. Paul, and graduated from the St. Paul Public Schools’ Central High School. Now he’s a parent in the Twin Cities, with two boys who have both been flagged by their teachers for emotional or behavioral disorder evaluations. He and his wife also resisted. They eventually moved their youngest son, whose teachers began insisting on an evaluation his kindergarten year, to Best Academy, a charter school in North Minneapolis, during his third-grade year. 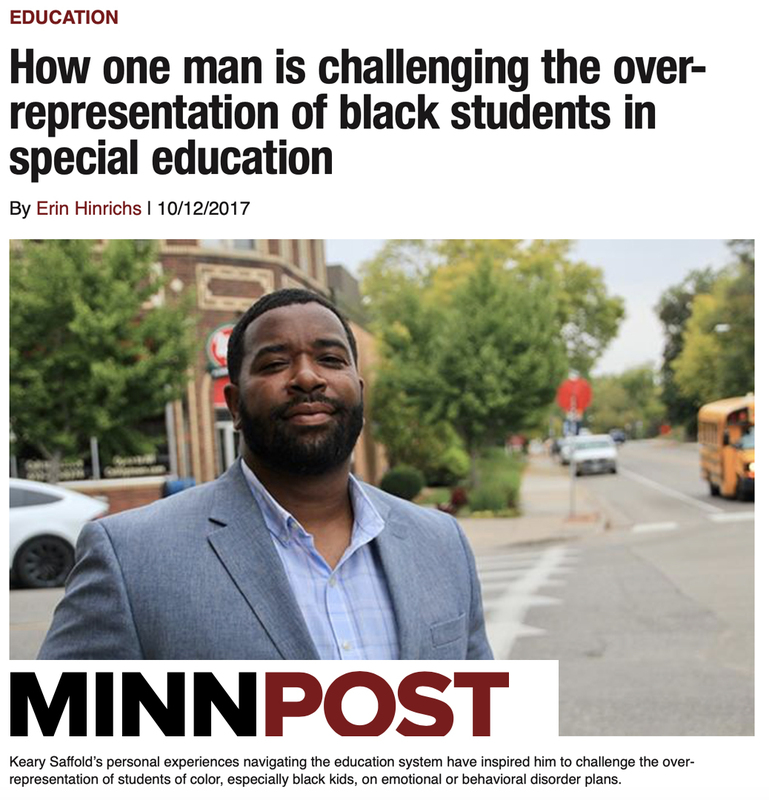 Saffold’s personal experiences navigating the education system have inspired him to challenge the over-representation of students of color, especially black kids, on emotional or behavioral disorder plans. It’s a largely subjective, catchall disability category. And this imbalance signals a need to re-examine how educators’ racial biases — implicit or explicit — play a role in how this label is being designated. Recently equipped with a $50,000 pilot-project grant from Minnesota Comeback, Keary is setting out to train 150 parents in the Twin Cities to serve as behavior development advocates at their schools and in their communities. The project aligns with his work as president and CEO of the KWS Consulting firm he established in 2006 and the KWST Behavioral Development Group, which he founded in 2017.